she is an amazingly beautiful todler, with long reddish curls, and chocolate-brown eyes, just like her mother. the rest of her face is just like edward's. yep i know what you're thinking->how will she be a red-hair in the movie, since edward is blonde? She has brown eyes like Bella did when she was human, 올리브 tone skin, long hair that is in ringlets and is the same color as Edwards. Never is the same height for long. she has bronze hair(like edward) in curls(from charlie). She is Pale, but rosy like bella when human. Her eyes are 초콜릿 brown. She is beautiful. She is described as having the facial features of her father, Edward, (high cheekbones, straight nose and full lips) as well as his unusual bronze hair color. However, she inherited curly hair from her grandfather, Charlie Swan, portrayed as ringlets that fall past her waist. Her eyes are described as 초콜릿 brown, just like her mother, Bella's, were while she was still human. She has pale skin, which has a blush to it because her 심장 pumps blood (though it beats faster than a normal human heart). Her skin is as tough as a vampire's, but her temperature seems to be unusually warm, only a few degrees below that of a werewolf. 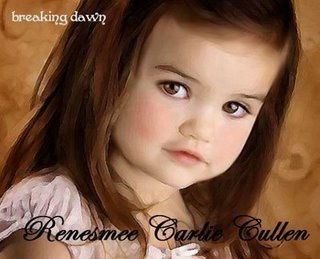 Unlike her family's skin, Renesmee's skin glows slightly in the sunshine like back-lit alabaster rather than sparkling like diamonds. Due to the massive amount of flowing blood in her veins and the high pumping of her 심장 she has red cheeks like petals.